Size : 21.0 x 21.8 mm. Weight : 5.20 grams. 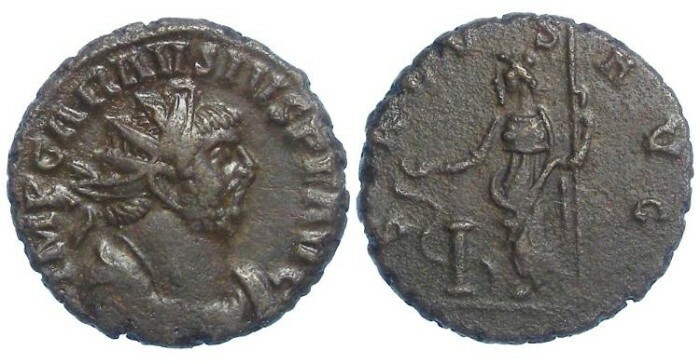 Grade : gVF with smooth metal on the obverse but a slightly grainy reverse..
Obverse : Head of Carausius right, with IMP CARAVSIVS P F AVG around, with a nearly full inscription (only the tips of a few letters are off). Reverse : Salus standing left, feeding a serpent arising from an altar, with SALVS AVG around (the top half of some letters are off the edge, but no letters are totally illegable). There is no mint mark on this coin, and while the mint of issue for these is no certain, it may have been London.